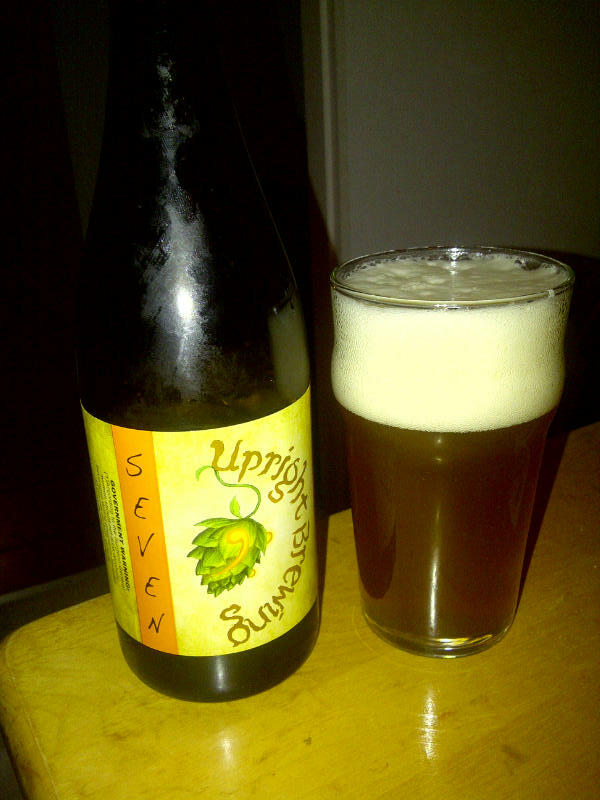 From Portland Oregon’s Upright Brewing comes their “Seven” a Saison. This Saison pours a cloudy golden colour with an off white head. The aroma is of sweet malts orange, and yeast. The flavour consists of sweet pilsner style malts, yeast, orange, lemon, pepper and some hops. The flavour is very light but great with no alcohol taste at all. The alcohol content is 8% and an IBU of 23. This is a very good Saison! Commercial Description: Seven is the most Belgian-esque of the numbered beers, where the house yeast is fully expressed with a big fruitiness while the hops provide spicy and herbal elements. The beer has some heft mid-palate but finishes dry. This entry was posted in Imperial, Saison and tagged beer, hops, imperial, lemon, light flavour, malty, orange, oregon, pepper, pilsner malts, portland, saison, seven, yeast, yeasty.